If your student seems a little more focused or even stressed these days, it’s usually just a natural consequence of exam time. As an antidote, Longwood has sprinkled the end of the semester with some traditions that provide a break from what can be an intense time of year. 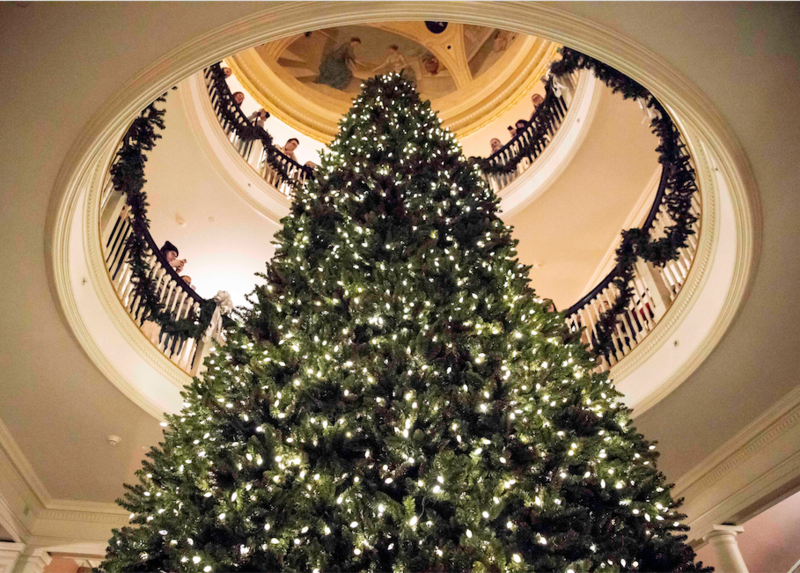 These include the Grand Illumination, the lighting of the 24-foot holiday tree in the Rotunda of Ruffner Hall; caroling by the Camerata Singers, also in Ruffner; and Late Night Breakfast in Dorrill Dining Hall. President W. Taylor Reveley IV officially started the holiday season on Tuesday night when he turned the switch on the 10,000 lights on Longwood’s holiday tree. The tradition of having a holiday tree in the university’s main building began in about 1887. Surrounding the tree are displays noting several traditional holiday celebrations, including Chanukah and Kwanzaa. The lighted 24-foot tree is an irresistible photo background. 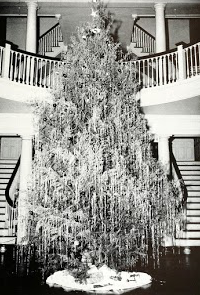 The first holiday tree displayed in the Rotunda of Ruffner Hall was in 1887. 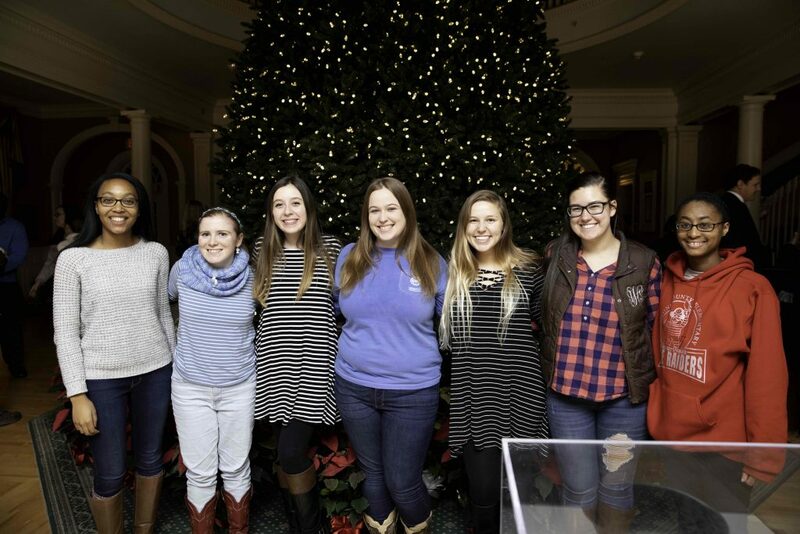 Tomorrow at 11:15 a.m. in the Rotunda of Ruffner Hall, the Camerata Singers will gather around the holiday tree and lift their voices in traditional melodies of the season. On Sunday, Dec. 2, beginning at 10 p.m. volunteer faculty and staff will serve up a hot breakfast of eggs, bacon, biscuits, and more to send students into exam week well-fed. 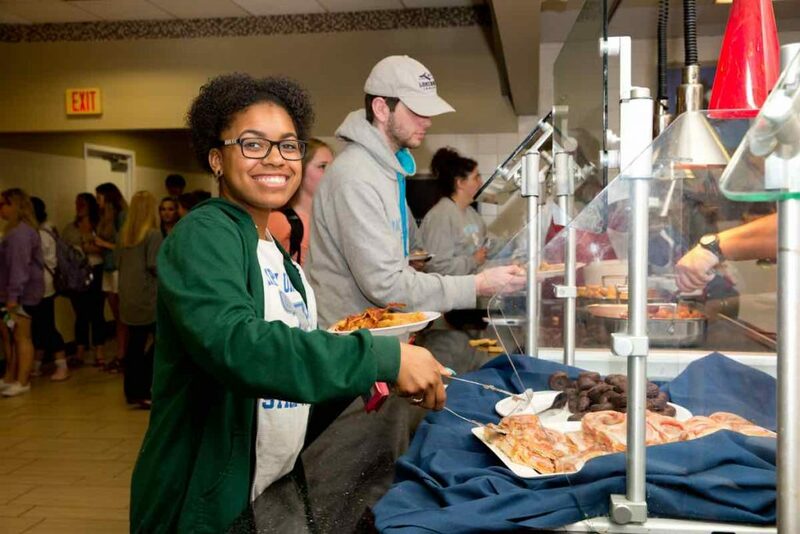 Legend has it that Late Night Breakfast began at Longwood in 1999 at the suggestion of Susan Sullivan, who still works at Longwood and is director of the University Center and Student Activities. 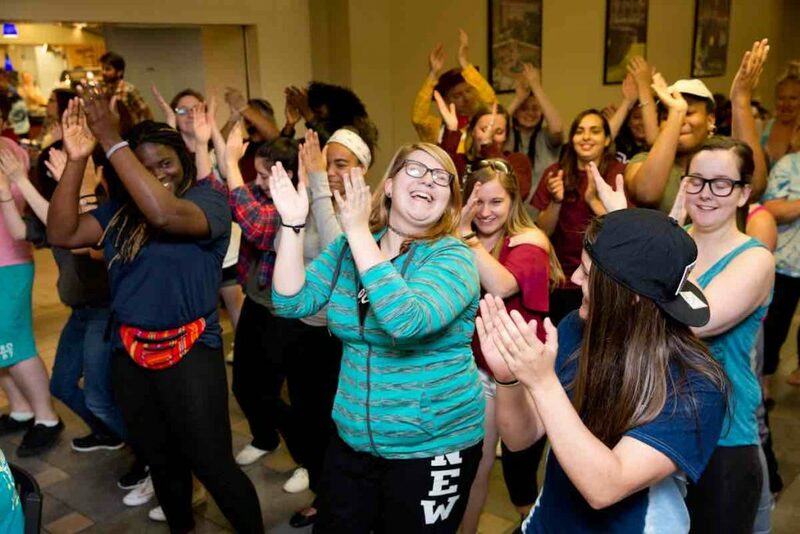 Fueled by the substantial breakfast and encouraged by faculty and staff, students usually turn the dining hall into an impromptu dance floor. Late Night Breakfast always includes dancing. Faculty and staff volunteer to serve breakfast to students beginning at 10 p.m. If your student seems to be experiencing more than the usual stress about exams, encourage him or her to discuss how they’re feeling with a friend or a professor they know—or to check in with the professionals at Counseling and Psychological Services (434-395-2409). Happy Thanksgiving Weekend from Everyone at Longwood! Even though many of the trees on campus are bare, I thought we could all enjoy one more beautiful fall photograph in honor of Thanksgiving weekend. Here at Longwood we have many things to be thankful for. Two that immediately come to mind are the opening of the Upchurch University Center in late October and the installation last Friday of Longwood’s newest statue of its patron hero, Joan of Arc—an awe-inspiring monument created by world-renowned Scottish sculptor Alexander Stoddart. I will be writing future posts about those two developments and what they mean for your students. Longwood’s newest monument to its patron hero, Joan of Arc, was installed last Friday. It stands 15 feet tall at the southern terminus of Brock Commons. The 84,000-square-foot Upchurch University Center is featured in the November issue of Longwood magazine. It includes meeting space for student organizations, a food court, a gaming area, several lounges and much more. For now, with the Thanksgiving feast recently consumed and perhaps a football game still to be enjoyed, those of us at Longwood send our sincere best wishes to your family. I hope that your student returns to campus recharged and ready to head into final exams, which take place the week of Dec. 3. The last day of regular classes is Nov. 30. We have clear blue skies and sunshine in Farmville today, and there’s another bright spot as well: The application period for next year’s scholarships is open! If your student will be enrolled at Longwood for the 2019-20 academic year—whether a freshman, sophomore, junior or senior this year, or even a graduate student—they are eligible to apply for one of the 370 or so scholarships available. Applications will be accepted through midnight on Feb. 1, 2019. Submitting the general application—which takes about 5 minutes to complete—is the first step. For some scholarships that’s all that is required. Other scholarships also require a scholarship-specific application, which could require the submission of a resume, a personal statement or essay, a portfolio of work or other information about the applicant. Some scholarships are merit-based, some are based on financial need and others have a combination of those requirements. In addition, some scholarships have very specific criteria that reflect the interests of the donor or the namesake of the scholarship. For example, the Camilla C. and Helen B. Tinnell Scholarship in English is designated for a full-time rising junior or senior who is majoring in English, has at least an overall GPA of 3.0 and a 3.2 GPA in English, and has a desire to teach. The Talmadge “Tal” H. Yeatts Scholarship goes to a student who is employed by Longwood’s food-service provider and demonstrates strong academic achievement. There are scholarships designated for students in the Honors College and for students who want to participate in one of Longwood’s Brock Experiences, which take students around the country to study important issues of the day. The students in the photo above traveled to Arizona in summer 2018 to explore immigration issues. At Longwood, Thanksgiving means fall colors, a special dinner—and planning ahead. Looking out my office window in Lancaster Hall, I can see that fall is definitely here. Several trees have turned a brilliant red, and leaves are sprinkled on the lawns and sidewalks. I can feel that fall is here, as well. After what seemed like an interminably hot and muggy September and early October, there’s been a refreshing chill in the air for a while now. It won’t be long before your student sits down to the annual family-style Thanksgiving dinner in Dorrill Dining Hall, complete with turkey and dressing and Longwood’s traditional baked Alaska for dessert. Set for Nov. 15, this meal harkens back to Longwood’s earlier years, when dinner was served family-style every evening. I have it on good authority that Longwood hung onto this tradition longer than most, with the freshmen who entered Longwood in 1986 being the first not to have family-style dinner every night. As Thanksgiving approaches—Nov. 22 this year—it’s not too early for your student to be thinking about plans for the break, whether they intend to travel home or stay on campus. Everyone here at Longwood wishes you and your family a very happy Thanksgiving. For our part, we are thankful that you have entrusted us with the education of your student. It’s a responsibility we take very seriously. All classes will meet on Tuesday, Nov. 20, including those that meet in the evening. 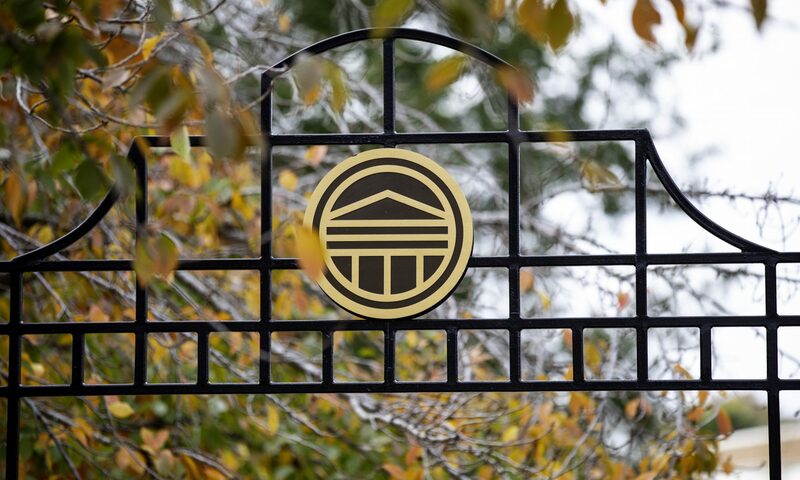 The university, including all administrative offices, will then be closed on Wednesday, Nov. 21, through Friday, Nov. 23, with classes resuming at 8 a.m. Monday, Nov. 26. *Information about arranging to stay on campus during the break is included below. Departs from Longwood, Madison Street near Iler Field, at 4 p.m.
Departs from Hampton Roads (Thomas Nelson Community College student parking lot) at 2:30 p.m. If your student lives in Longwood-managed housing, they can arrange to stay on campus during the Thanksgiving break, in their current hall/room, by filling out the required online form before the pre-deadline of midnight Nov. 19. Here’s a link to the form: Thanksgiving break housing form. Filling out this form by the deadline assures that your student’s ID card will continue to provide access to the residence hall and that, as a safety measure, the Longwood Police Department knows that your student is on campus during the break. If your student does not determine that they need to stay on campus until after the online registration process closes at midnight Nov. 19, they should contact Housing and Residential Life at housing@longwood.edu. Please keep in mind that Housing and Residential Life will close at 5 p.m. Tuesday, Nov. 20, and will not be available after that time to answer email or take telephone calls. After 5 p.m. Tuesday, Nov. 20, contact the Longwood Police Department for assistance at 434-395-2091.